[Patient #1] was brought this Afternoon as a Patient by the Certificate accompanying it appears that She is about 48 Years of Age and has been 11 Years Insane—She appears to be of the Melancholy cast. [Patient #1] admitted into the Asylum “for the relief of persons deprived of the use of their reason.” 5th Mo. 20th 1817. She is a native of Wilmington Del. aged 49 years. Her disease is of eleven years continuance. She has been in the Pennsylvania Hospital some years (number not known) and was discharged from there incurable. The last three years she was confined in the Poor House near Wilmington. No cause has been assigned for her derangement. She never has shown any disposition to injure herself or any other person except her Father. Doct. Monroe says in his certificate that no medical means have been used for her recovery. The years leading up to Patient #1’s arrival were difficult. She had been confined to Pennsylvania Hospital in Philadelphia. When she had been discharged, she returned to a poor house near Wilmington, her hometown. Whoever—probably her father— brought her to the asylum must have been intent on finding her better care, for they were willing to travel nearly 40 miles and pay $3.50 per week for her to stay at the asylum. Yet they didn’t offer the physician much information about her condition or its cause. 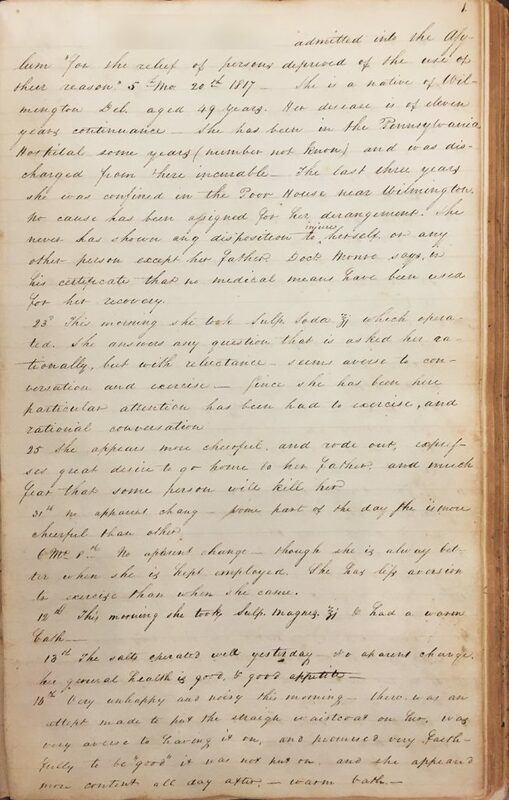 The physician’s Medical Register records symptoms and treatments for patients in the asylum. This is the first page of Patient #1’s treatment. Three days after she was admitted, the physician prescribed medicine “Sulp. soda,” probably the cathartic sulphate of soda, which produced the expected results. Although she engaged the physician in rational conversation when she had to, he found her reluctance to converse or exercise as evidence that she continued to suffer from her melancholy. Two days later, he reported that “She appear[ed] more cheerful … [and] express[ed] great desire to go home to her father, and much fear that some person will kill her.” Two weeks later the physician prescribed another cathartic medicine, this time “Sulp magnes.,” probably sulphate of magnesia (or Epsom salt), along with a warm bath. The superintendent noted in his daybook that the warm bath and “salts” quickly became a common treatment. Patient #1 continued to express a desire to go home to her father. Only threats of restraint quieted her. Some days she engaged in productive labor, other days she hoped to die. All the while the superintendent and the physician administered different treatments, medicines, and threats of constraint to bring her behavior within the bounds of acceptable. This morning [Patient #1] left us. Her father mentioned his gratitude for our kindness and his high opinion of the value of the Institution. [She] parted with us on friendly terms and engaged to come back without difficulty if her father and Brother required it. Through the superintendent’s records and the physician’s register we can piece together bits of her life during the three years she was in the asylum. 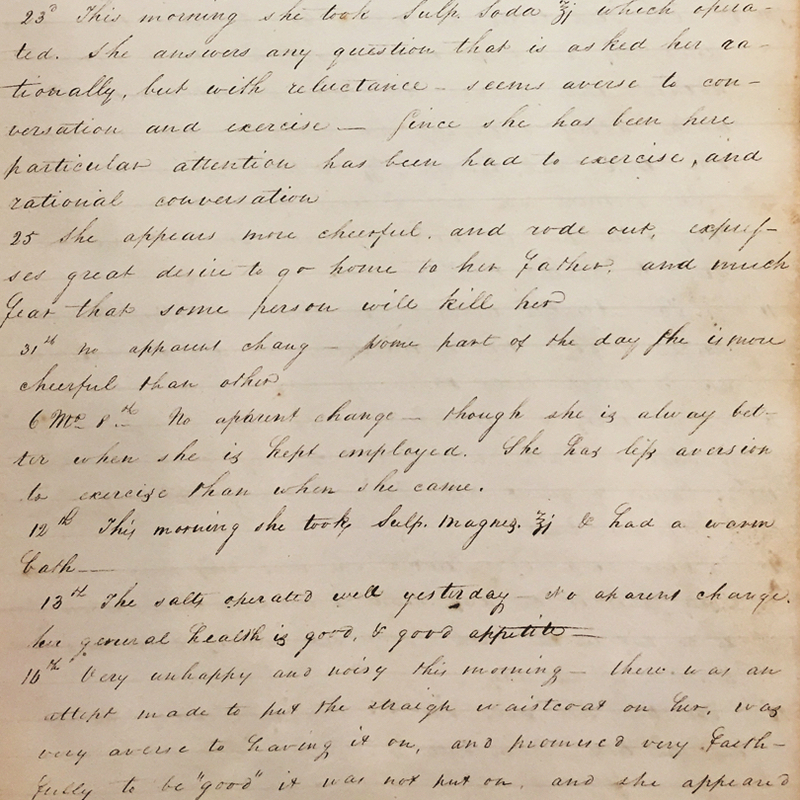 Her experience in the asylum, the types of medicines and other medical treatments as well as the division of responsibilities for administering those treatments between the superintendent who had no medical training and the physician, the role of the superintendent’s wife, the importance of employment, her reported behavior, etc., give us a glimpse of what it meant to be deemed insane in early 19th-century America.